President Donald Trump’s scheduled meeting in Vietnam this month with North Korean leader Kim Jong Un comes at a time when many people around the world, especially in the Asia-Pacific region, continue to express concerns about North Korea’s nuclear program. A median of 52% across 26 countries surveyed by Pew Research Center between May 14 and Aug. 12, 2018, consider North Korea’s nuclear program to be a major threat to their country. Roughly half the interviews in the survey were fielded before the first meeting between the two leaders on June 12, 2018. Worries are especially prevalent in the five Asian-Pacific countries surveyed. There, a median of 61% say the nuclear program is a major threat. In Japan, nearly three-in-four (73%) see the nuclear program as a threat. Two-thirds in neighboring South Korea consider North Korea a nuclear threat. And roughly six-in-ten in the Philippines and Indonesia also have worries about the nuclear program. In the United States, nearly six-in-ten see North Korea’s nuclear program as a major threat. Women are 19 percentage points more likely to be concerned than their male counterparts: 68% of women say that the nuclear program is a major threat, while 49% of men say the same. Americans ages 50 and older are also more likely to be concerned (66%) than those ages 18 to 29 (42%). Republicans and Republican-leaning independents as well as Democrats and Democratic leaners see the program as a major threat. Europeans express tempered concern, with a median of 52% labeling North Korea’s nuclear program a major concern. Worries are highest in Greece and Spain, where about six-in-ten hold this opinion, and lowest in Sweden, the UK and the Netherlands, where only about four-in-ten say the same. 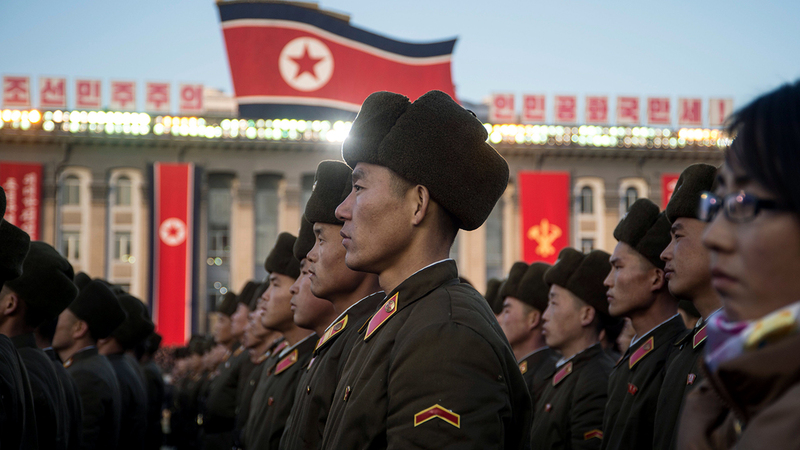 The level of concern over North Korea’s nuclear program has varied widely since 2013. There has been a significant increase in those seeing the program as a threat in the three sub-Saharan African countries surveyed, with a 26-percentage-point increase in Nigeria, a 21-point increase in South Africa and a 17-point increase in Kenya. In the Asia-Pacific region, concerns grew by 18 points in Indonesia but dropped by 15 points in South Korea, where President Moon Jae-in has played a role in trying to reduce hostilities with the north as well as facilitate talks with the U.S. Ratings in the region’s other countries have remained generally unchanged. Also worth noting is how South Koreans evaluate the U.S. and its leader. Of all the countries surveyed in 2018, South Koreans have one of the most positive evaluations of the U.S., second only to Filipinos and Israelis. Ratings of Trump, however, remain lukewarm, with less than half saying that they have confidence in Trump to do the right thing regarding world affairs. 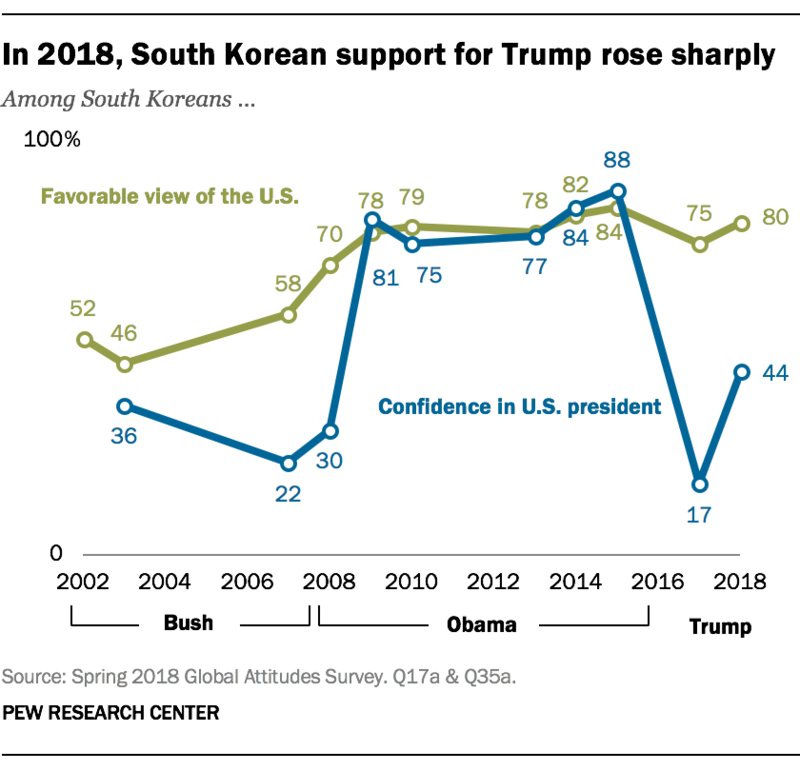 However, this represents a substantial increase from before the first summit, when only 17% of South Koreans had confidence in Trump. Still, the 44% confidence in Trump remains half the level of support Barack Obama had in 2015. South Koreans are equally likely to identify the nuclear program as a major threat regardless of how confident they are in Trump. However, those with an unfavorable opinion of the U.S. (42%) are 30 percentage points less likely to say that the North Korean nuclear program is a major threat than those with a favorable view of the U.S. (72%). A survey conducted in December 2018 by the Chicago Council on Global Affairs found that a plurality of South Koreans (42%) see their country’s national security situation as better than it was four years ago. Still, three-in-ten say that the situation has stayed the same, and roughly a quarter (23%) believe the situation has worsened. Positive evaluations of the security situation are higher among supporters of President Moon’s Democratic Party (DP, 66%) and especially low among supporters of the opposition Liberty Korea Party (LKP, 13%). Christine Huang is a research assistant focusing on global attitudes at Pew Research Center.